The M12 Compact Vacuum provides more power to clean anywhere. A high performance motor delivers maximum suction for a wide range of construction materials, such as wood chips and metal shavings. With up to 29 minutes of run-time on a single charge*, the M12 Compact Vacuum can be used for spot clean-up or large area vacuuming. Lock-on switch reduces user fatigue during extended use. Additionally, the 0850-20 comes with a utility nozzle, crevice tool and extension wand for maximum application versatility. Built to withstand job site conditions, this portable vacuum is backed by a 5-year warranty. The BLACK+DECKER CHV1410L 16V MAX* Lithium Hand Vac is lightweight and powerful and is always ready to quickly tackle household messes. The cyclonic action helps keep its filter clean and suction strong. Easy to use and easy to empty. Includes: (1) Hand Vac, (1) Washable pre-filter, (1) Washable filter - VF110, (1) On Board Crevice Tool, (1) On Board Brush, and (1) Charging Base. 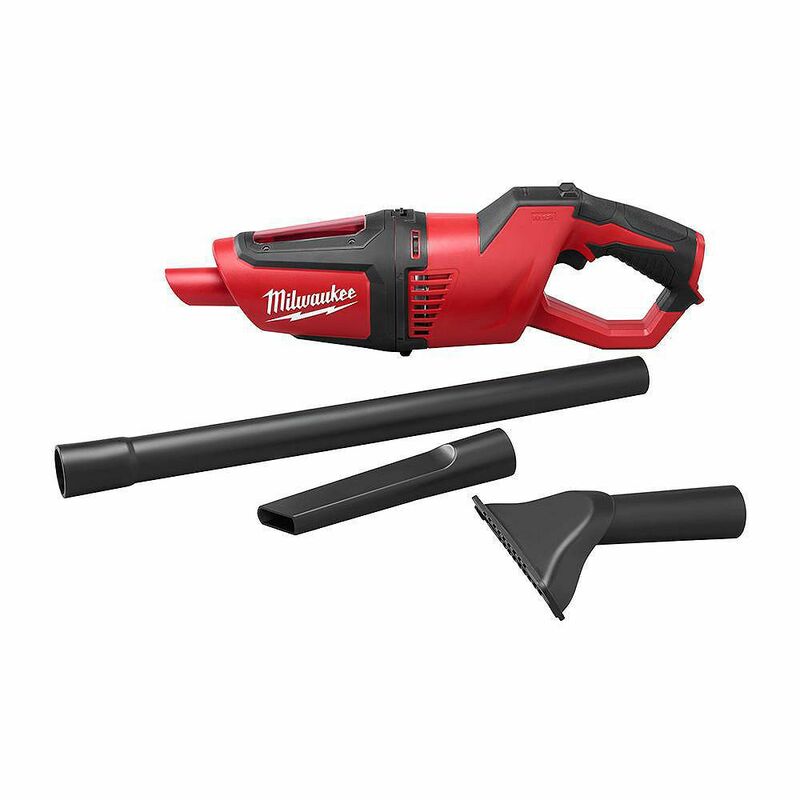 M12 12V Lithium-Ion Cordless Compact Vacuum (Tool-Only) The M12 Compact Vacuum provides more power to clean anywhere. A high performance motor delivers maximum suction for a wide range of construction materials, such as wood chips and metal shavings. With up to 29 minutes of run-time on a single charge*, the M12 Compact Vacuum can be used for spot clean-up or large area vacuuming. Lock-on switch reduces user fatigue during extended use. Additionally, the 0850-20 comes with a utility nozzle, crevice tool and extension wand for maximum application versatility. Built to withstand job site conditions, this portable vacuum is backed by a 5-year warranty. M12 12V Lithium-Ion Cordless Compact Vacuum (Tool-Only) is rated 3.8 out of 5 by 252. Rated 5 out of 5 by Don from It was for my wife for use in the house.... It was for my wife for use in the house. She loves it especially the long arm attachment so she doesn't have to bend down to vacuum up pieces of dirt, etc. she loves the ease of use of this vacuum. Rated 2 out of 5 by HomeDepotCustomer from Not quite the suction I was hoping for.... Not quite the suction I was hoping for. Rated 1 out of 5 by Colin from Underpowered Doesn't have enough suction. Should have bought the 18v. Not worth the money. Rated 5 out of 5 by Kristin from Easy to assemble and lightweight. It goes with me everywhere. I use it in my car, house, and job ... Easy to assemble and lightweight. It goes with me everywhere. I use it in my car, house, and job site. Rated 4 out of 5 by Rozman from I most appreciate the fact that I use the same batteries with all my Milwaukee M12 tools! No sepa... I most appreciate the fact that I use the same batteries with all my Milwaukee M12 tools! No separate chargers, no different multiple batteries laying around. The dust collection cone comes off easy for dumping and cleaning. Rated 4 out of 5 by Turbo159 from This works way better than I expected. I just... This works way better than I expected. I just wanted it to replace an old Dust Buster, and this is way better than that. Great for cleaning up the bathroom and laundry room. Yes, suction could be better, but for hair, dust, fur, lint, etc, no problem. Would that vacuum be compatible with shop vac attachments ??? Is this comes with battery and charger? Does it comes with battery and charger?